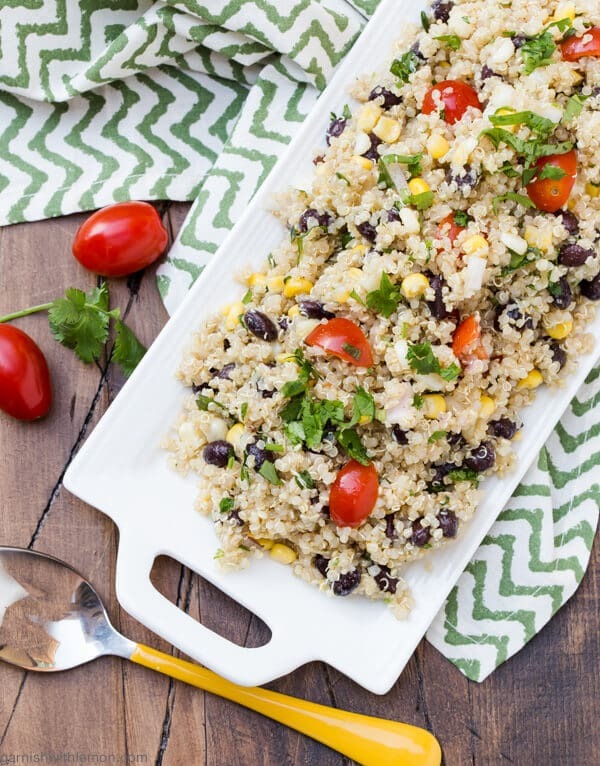 Add a little variety to your lunch menu with our easy, make-ahead Southwestern Quinoa Salad. Lunches are always a challenge. Whether I have the kids home from school or packing a lunch to go, it’s always a struggle. Raise your hand if you have this same dilemma. I have shared with you before about Charlie’s expansive palate, which makes his lunch pretty easy. Some days, he even asks for a salad. This Grilled Chicken Caesar and a Classic Wedge are two of his favorites. And then there is Greta who happens to be a little pickier. However the one thing that Greta cannot get enough of is quinoa. Who would have thunk that? Not me; it still surprises me to this day. I started making this Southwestern Quinoa Salad this summer, and it is her new favorite. It’s also now at the top of her lunch requests. Coming from a girl whose knee-jerk reaction to anything is chocolate, this is something big! This Southwestern Quinoa Salad is the perfect base for a healthy lunch. It’s packed with protein from the black beans and quinoa along with a veggie fix of corn and chopped tomato. Plus, it’s a great change of pace from the same old peanut butter sandwich. Not only is it a great lunch option, it works for dinner on the run, too. Add some grilled chicken breast or leftover flank steak, and you have yourself a killer entree salad. And did I mention that the leftovers are just as good?? 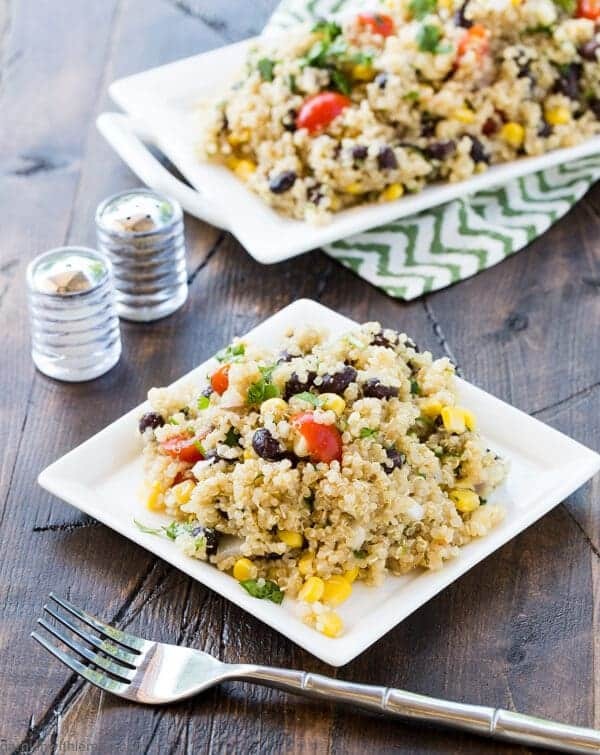 With so many ways to serve it, you can’t go wrong with this Southwestern Quinoa Salad! Tip: You can never have too much cheese, right? If you love cheese as much as we do, this salad would taste great with some feta crumbles or queso fresco stirred in! Need a great knife for chopping and dicing? This Wusthof Chef’s Knife is one of my favorites! Whisk all dressing ingredients in a small bowl and set aside. In a medium bowl, place cooked quinoa, black beans, corn and tomatoes. Stir until combined. Add dressing and toss to coat. Season to taste with salt and pepper. Add chopped cilantro and stir gently. Refrigerate until chilled. Serve at room temperature or chilled.